10/29/16 – We are adding new reviews on a regular basis. We’ve recently added more Pillow Types to cover what you are after such as education on microbead pillows, body pillow, lumbar and one of the most popular pregnancy pillow Boppy!! How Do You Find The Perfect Pillow? Report after report shows that a good night’s sleep is an essential component to healthy living. Yet many people struggle with sleep. An often overlooked component of a restful night’s sleep is the humble pillow. Finding the best pillow ensures a night of restful sleep, while sleeping with the wrong pillow can exacerbate conditions like headaches, neck pain, numbness in the shoulders and arms, sneezing, and wheezing. But that’s not all. Many people are shocked to discover that half the weight of old pillows is often contributed to mold, fungus, mildew, dust mites, and dead skin cells. That means that people who get the recommended 8 hours of sleep are spending a considerable amount of time snuggled up to some pretty nasty bedfellows that can lead to respiratory problems in certain individuals. Because the quality of a pillow encourages or detracts from a good night’s sleep, sleep experts recommend replacing pillows every 12-18 months. Pillows that are older than 2 years old can actually hinder sleep because they break down over time which reduces the amount of support the pillow provides. But buying a new pillow can be a hassle. There are so many options, they can be pricey, and what happens if you buy the wrong kind? A new pillow feels like a commitment, and some people don’t want to jump from a tried and true favorite into an untested relationship with something different and new. 10/29/2016 – We’ve recently posted some new articles that may be of interest to you. We find that many people look to their pillow to help with their sleep which id does (kinda like a good hammer is to a carpenter) however there are many factors besides the “tools” you use to get a good nights sleep. These are pretty interesting topics to take a look at when you have time. Pillows range in price from $15 dollars to over $200 dollars. Most quality pillows will run between $25 to $70 dollars depending on the type of material such as foam, gel, etc. You can receive deep discounts buy buying pillows in a multi-pack, typically in a set of 2 or 4. More economically priced pillows you may desire to purchase separate covers for so keep that in mind when factoring in pricing. I’ve personally paid extra for a higher quality pillow and have never regretted it. I’ve found that the pillow will last longer, have a better cover and helps me sleep more comfortable. So when considering you’ll be sleeping on it every night, don’t let $10 or $15 dollars get in the way of a better nights rest. Steps To Finding Your Perfect Pillow? First, you should identify the type of pillow your looking for. Is there a special condition such as neck pain, back pain or pregnancy? Are you a side sleeper, back or stomach sleeper? Are you someone that travels and are looking for a great pillow for traveling? Do you use a CPAP machine? Or, are you looking for a general all use pillow or are in need of a wedge pillow? As you will find, there are many speciality pillows available for various situations and we help you analyze each one so you have the best information to make a quick and educated decision. Why You Might Need A New Pillow? Most people have used the same pillow for several years. Your body adjusts to changes over time however once you start experiencing unrestful nights sleep or better yet are sore waking up sore are tell time signs it’s time for a change. Once you receive your new pillow you still need to allow a couple weeks for an adjustment, after all you’ve been using that old pillow for years! It’s quite possible you’ve bought the wrong type of pillow, if you haven’t already tried a memory foam pillow that’s typically a great place to start. 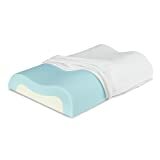 If your one that gets hot easy at night be sure to try a gel pillow, they will help keep you cool and comfortable while you sleep. Will An Improved Pillow Help You Sleep Better? In short, Yes! Studies have found that having the proper bed and pillow can make a tremendous difference with how well you sleep. Once you are properly equipped there are additional strategies that can help you sleep better. I can personally testify that for years I slept on an old mattress and pillow that was handed down and always wondered why I woke up sore, stiff and had neck cramps. After getting the right pillow (for me I prefer memory f) and mattress (my personal choice is Tempur-Pedic) it was incredible how much better I slept and how much better I felt. If you figure that 1/3 of your life is spent in bed then it makes sense to invest wisely, especially when the other 2/3 your awake reflects on how well you sleep. You’ve heard the saying, “invest in a good pair of shoes“. The top reason most people don’t sleep well at night is because they aren’t relaxed before going to bed. One of the very best things you can do is take a hot bath before going to bed. In today’s hectic world of everything needing to be done now it may be hard to think how you can find time to take a nice relaxing warm bath however this further points to the problem. If you adjust your schedule to take a warm bath for 5 nights in a row and read a book while you relax in the soothing water (or listen to music) you’ll find this simple adjust can have a dramatic impact. Regardless of how silly it seems rest assured (no pun intended) you’ll find being more relaxed when you go to bed helps you sleep much better. It’s a valid point, but such concerns can be alleviated by testing new pillows before purchase. The most popular are memory foam pillows. Pillows should be purchased based on sleeping position. The ultimate goal for any pillow is to create a neutral alignment of the head and shoulders in which the neck aligns with the spine. The best pillow ever for this depends on a person’s sleep position. Back sleepers should look for a thin pillow that cradles the neck without pushing the head too far forward. Side sleepers need a firm pillow that gives support to the area between the ear and the shoulder. Stomach sleepers require very thin, almost flat pillows, although some stomach sleepers forgo pillows altogether. However, stomach sleepers should at least consider a pillow placed under the stomach to provide additional support for the lower back. Of course, sleep position is relative. Not everyone adheres to a particular sleep position each and every night. In fact, some people, particularly those who travel and find themselves sleeping while sitting, benefit from having an assortment of pillows to choose from. Doing so can ensure the right pillow fit for any sleeping position. But sleeping position is just one consideration. Material is another consideration, and frankly one that keeps many people from buying new pillows. It can be difficult to decide which pillow is the right choice when there are so many options available. Thankfully each pillow type is recommended with specific needs in mind. Have you ever wondered what the history of the pillow is? Down/feather pillows are the most traditional and most recommended pillows available. They are firm yet soft and the filling can be scrunched around to provide the necessary support to just the right place. Some people worry that down/feather pillows worsen allergies, but most are hypoallergenic and may actually be a better choice for allergy sufferers than synthetic pillows. For those who like the feel of down/feather pillows but don’t like the feathers, foam or polyester fiberfill are comparative options. A word of caution, though; foam and polyester tend to break down faster than the down/feather alternatives. of shapes, like the popular s-shaped pillow, which makes finding a pillow ever a little bit easier. Bear in mind that some memory foam users find memory foam pillows to be hotter than other varieties. Some memory foam also has a lingering chemical odor. Latex pillows are another great option to provide additional neck support. Latex is the firmest pillow option available, which helps ensure proper back and neck alignment. Latex can be a good choice for people with allergies as it is mold and dust-mite resistant. Wool/cotton pillows offer the same benefits of latex pillows, but are made of natural materials. They are almost as firm as latex pillows and are hypoallergenic. They are also resistant to mold and dust mites. Cervical pillows have extra cushioning along one side of the pillow to provide extra support to the neck. They’re a great option for back sleepers. Cervical pillows come in a wide variety of shapes and materials including foam, latex, and wool/cotton. Chiropractors love water pillows and some physical therapists endorse them as well. Like a water bed, water pillows allow the sleeper to customize the density and support of the pillow based on preference and need. With proper care, water pillows are surprisingly durable, although a puncture from a pet or child can make a mess. Cooling pillows are filled with beads that help pull heat away from the sleeper. They can be found in a variety of firmnesses and are great for people who experience night sweats or heat flashes. Oxygen-promoting pillows were based on the fabric used to make socks to promote circulation in patients with diabetes. Though researchers aren’t sure how beneficial these pillows are, they have found that the oxygen content in small blood vessels increases up to 29% with usage. Moreover, patients who use these pillows report a reduction in overall pain after use. Positional pillows, like wedges and rolls, provide additional support for body parts like the back or legs. Pregnant women particularly find comfort through the use of positional pillows. These come in a range of sizes, shapes, and materials. Comfort, support, and sizing should be considered when buying positional pillows. Check out what WebMD has to say about choosing the perfect pillow. We hope that you have found this website useful in you quest for buying the best pillow for your needs. If you should have any questions, comments or recommendations please don’t hesitate to drop us a line here. Enjoy your new pillow and here’s to a better nights sleep!